School Mission - Provide quality Montessori and Elementary education combined with knowledge of the Vedic values, Indian culture and language to the young children of the growing Indian community. School Motto – Academic Excellence and Spiritual Growth. School is Accredited by Texas Alliance of Accredited Private schools (TAAPS) since August 2016. Unique curriculum. Traditional and Montessori program supplemented with Hindi language, Vedic mantras, Prayers and Moral Values taught under the guidance of Arya Samaj’s Acharyaji. Montessori curriculum is taught in Preschool till 1stgrade. 2nd to 5th grade study an accelerated Common core and TEKS based curriculum with special focus on Math and Science. School’s philosophy and methods have been proven by the success of its ex-students. In addition to excelling in academics the graduating students are proud of their heritage and confidently transition to the large and diverse school environments. 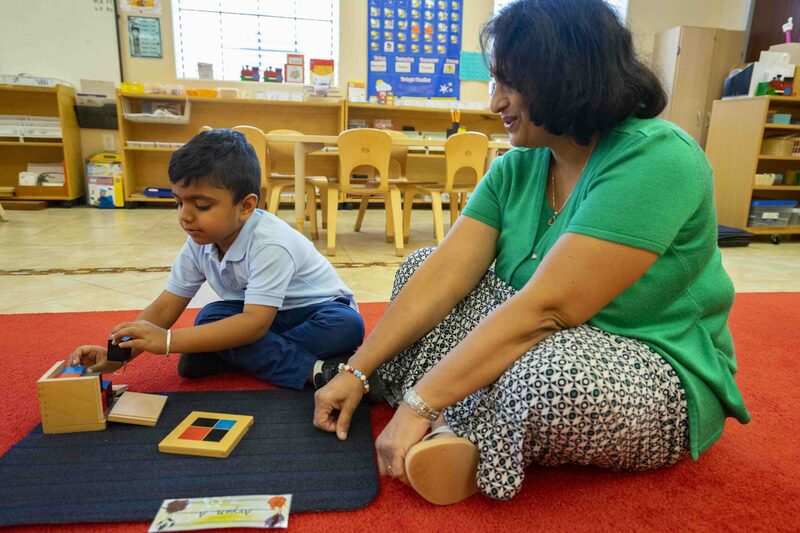 DAV Montessori graduating students have been accepted in prestigious programs (Vanguard, Magnet, Gifted & Talented) in both private and public schools in the Greater Houston area. In these schools, the children are excelling academically and confidently participate in all the school activities. Graduates from the first few years of DAV Montessori are now at some of the top universities in the country. Professional, dedicated & experienced faculty. Our teachers are enthusiastic educators committed to creating an inviting and warm atmosphere. Low student/teacher ratio leads to individualized attention and a personalized learning plan, designed to help each child reach their full potential. Early exposure to stage performances and cultural programs in front of large gatherings at the many Arya Samaj and DAVM school functions in the beautiful ASGH hall builds unparalleled stage presence and confidence. Yoga, P.E., Art and basics of Computers are part of the school curriculum. Students scoring 2-3 grade levels above on National standardized tests. Students have been participating in the Private School Interscholastic Association (PSIA) competitions and have won first place in state and district. Gated, safe and secure school compound. Extended school day facility available. School hours are 7:00 am to 6:00 pm. Bus service available for students.